Gaza is home to almost two million Palestinians, the majority of whom are long-term refugees (a further 3.25 million Palestinians live in the West Bank). It’s been run by Hamas since elections in 2007: the group is designated as a terrorist organisation by Israel, the US and the EU among others. The West Bank is governed by the Palestinian Authority, which is currently controlled by Fatah, rivals of Hamas. 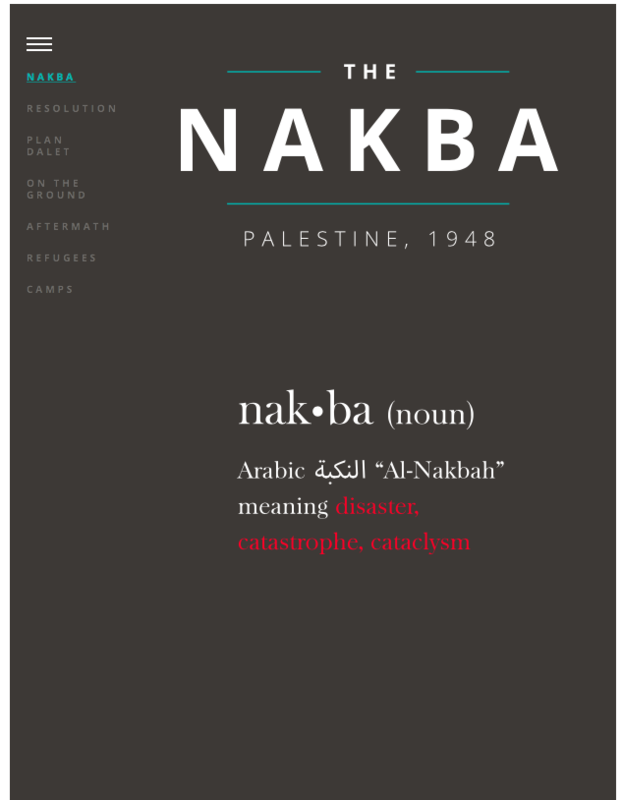 The dominant event for Palestinians in Gaza during the past century has been the Nakba of 1948, when hundreds of thousands were driven from, or else fled, their homes in what is now modern-day Israel as the state came into existence. The right of return to ancestral homes (or “Haq al-Awda”) is the over-riding long-term priority for many Palestinians: it forms part of United Nations resolution 194. 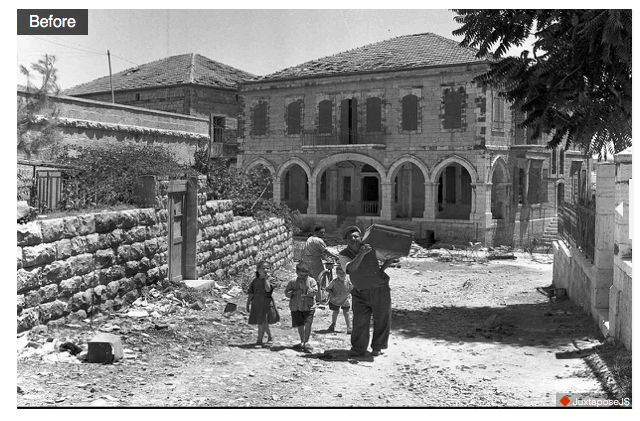 Palestinian houses and cinemas, shops and mosques, train stations and markets were all lost in 1948. Tarek Bakri, a researcher and archivist based in Jerusalem, started to collect archive photography which documented these losses. The image below slides left and right: MEE has published more examples. Above: Israelis looting houses in the Palestinian neighbourhood of Musrara in Jerusalem. 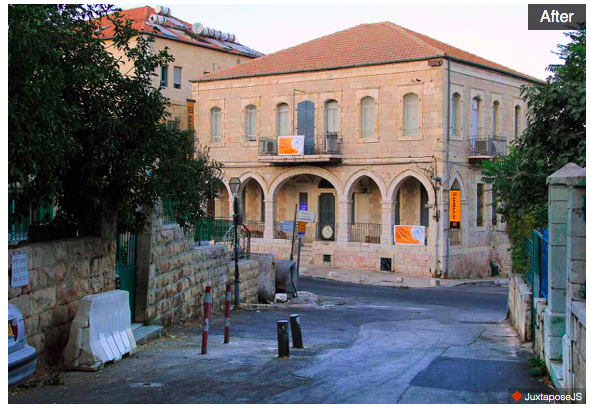 Musrara is one of the oldest neighbourhood built outside Jerusalem’s Old City walls in the 1860s. The seven decades after the Nakba have been ones of turmoil and crisis for the residents of Gaza, including occupation, uprisings and Israeli military operations. Long-term living conditions in Gaza are some of the worst in the Middle East. A report by the UN in 2015 noted that the economic well-being of Palestinians living in Gaza was worse than in 1995 and that it may be “uninhabitable” by 2020; last year the organisation said that conditions were “unliveable“. Economic development in Gaza has stalled due to wrecked infrastructure, the blockade imposed by Israel and internal Palestinian political conflict. Major military operations by Israel especially have had an impact which long outlast the duration of any army action. Aside from wrecking infrastructure including electricity lines and power stations, health services and water supplies, Israeli military assaults on Gaza have resulted in the deaths of thousands of Palestinians, as well as Israeli soldiers and civilians, most notably during a string of military operations between 2006 and 2014. On 30 March, Palestinians started regular protests in the lead-up to the 70th anniversary of the Nakba on 15 May. Israeli forces sometimes fired at the demonstrations, saying they were doing so to defend the border – with fatal consequences. 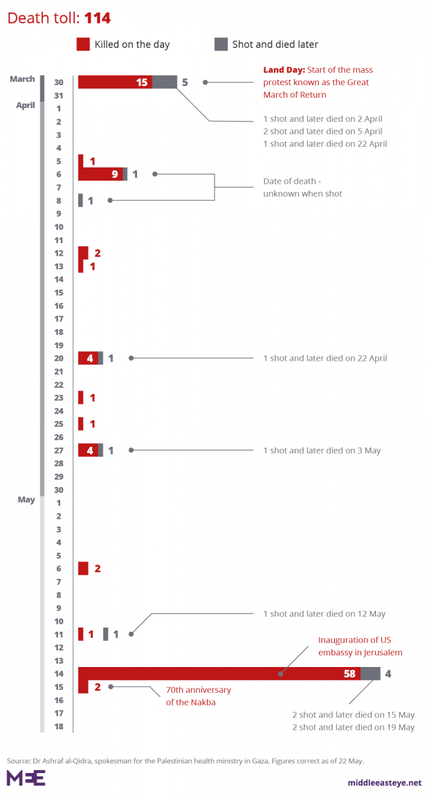 The highest number of deaths was on 14 May, the day that the US embassy opened in Jerusalem, when 62 were killed. 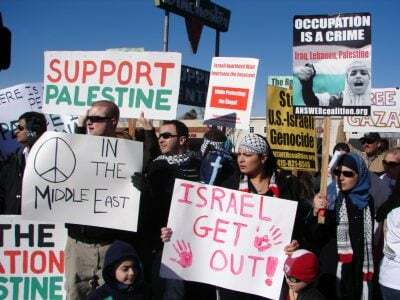 Many protesters were also demonstrating about the conditions under which they had lived in Gaza for years.